3 months have passed since I tumbled down that rabbit hole into this fascinating whisky wonderland. As each day passes I feel it is more and more important to encourage others to embark on their very own expeditions of whisky discovery. It has been quite a journey so far, meeting Ludo Ducrocq helped reinforce that I was heading in the right direction and treading a good path. Ludo is the global ambassador for Grant’s. The entire Grant’s story is a long and fascinating one and to summarise it feels somewhat disrespectful. In very simple but incredibly important terms, at the core of this story lies the feeling of “being passionate about the whisky”. A very strong foundation on which a whisky legacy has been built. It still stands strong today, the care and craftsmanship remaining unchanged. 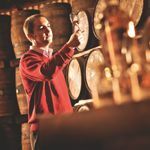 Ludo’s passion for whisky and the Grant’s story is as grand as his title suggests. It was amazing and inspirational to me, meeting someone who just “gets” why we enjoy whisky. Someone so willing and enthusiastic to help you understand, is a refreshing change to the pretentious trap of shite so many seem to fall into far too willingly. So on to the whisky. From the family reserve, to the ale cask, to the sherry cask to the 12 and the 18, finishing at the 25. I am not going to review any on this particular ramble but I can most certainly confirm that all are an exceptional expression of that Grant’s passion. It was very interesting to see how each whisky was very individual yet had a sense of familiarity. The 18 literally blew my cowboy boots off. Please check back soon for the individual reviews. What is there to conclude? Well after experiencing this one-on-one tasting experience with Ludo, I am confident that even the most stubborn “blended whisky basher” would find it incredibly hard to argue with what Grant’s has achieved from 1887 to present day. The current range is exceptionally well balanced, rounded and most importantly accessible to all. Dan and I would like to say a BIG thank you to Ludo and Becky for making this happen. Also a thank you to the Albannach whisky bar located on Trafalgar Square in London. The cost of a wild turkey was however certainly wild! You comment on the Wild Turkey? Son you disappoint! Wild Turkey is both an exceptional and unusually decent whisky for such a stupidly low price. I’m just going to say a quick thanks to Becky and Ludo for treating us so well and truly making us feel like we have landed on the whisky scene in style. Sitting in a Uber trendy London bar, being lead in a whisky tasting by one of the worlds leading experts, asking engaging questions and being rewarded with deep insights was a mind blowing experience. I was so impressed by Ludo’s depth and breadth of knowledge I found myself wanting to ask 1000 questions all at once. Hopefully this is just the start on a journey discovering the joy of malt whisky, opening up doors to new, hazy & magical worlds. Wading into the whisky world head first and bringing you the results. Does the Grants 18 hold its own against Single Malts? Looking forward to a review. The 25 was also very special. The only problem is you can only buy the 18 and 25 direct from the disitillery gift shop. Apprently they will post it no problem but there is no distrubution outlet which is a great shame. I am sure Ludo and others will be able to work their magic and get it on the UK shelves soon. Holds its own and then some, really its up there as a great whisky in my books. The skill and craft that goes into some of the blends shouldn’t be underestimated. Thanks guys, it was really great to meet the two of you over a dram (or 6) and thanks for the kind words you’ve written about Ludo and our whisky. Ludo’s planning a blog in the not to distant future about our night, so keep your eyes peeled. Slainte (just because I know you love it). Look forward to reading your and his take on the events! I almost have that water calulator ready too, I will drop you a line when its done so you can be the first to have a go.